The Partner Plus Communication Device can be joined together to be a dual message communicator made for anyone with a disability that effects their speech or it can be used to record reminder messages. Therapist or Caregivers can record a message on each device for the end-user to playback that can be up to 30 seconds worth of total record time. 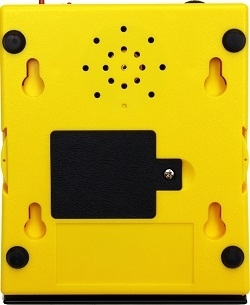 They have a low profile activation plate allowing the user to activate the device with a small amount of pressure applied. Graphic overlays or picture cards can be easily changed by simply sliding them into the designated area on the actuation panel. The graphic overlays can be made using AMDi’s Overlay Designer software included on the resource CD within the device package! Small objects can be placed on top using the Velcro strip and laminated or plastic picture cards can be placed in the slot provided on top of the Partner/Plus to help the end-user learn object discrimination. The Partner Plus is simple to operate!Just turn the unit on, adjust the volume and press the panel to activate the message. The Partner Plus system also contains mounting holes on bottom for hanging on walls.